USB Powered Travel Shaver | OhGizmo! 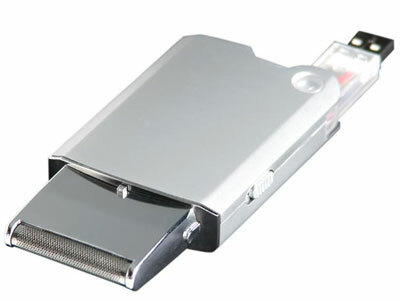 So, you can look at this USB powered shaver a couple of ways. You can think of it as the perfect travel companion, recharging off your laptop while you work furiously at a cafe somewhere in the world, only to be ready to clean that beard off before your big meeting. Or, more likely for those of us reading blogs all day, as the sedentary geek’s best friend, sitting by the desktop charging away in case you ever decide to clean yourself and get a first life. Either way, this handy shaver is quite small, measuring 4 ?? x 2? and comes in a dandy gift box along with the cleaning brush. The company that sells it does not seem to sell retail, opting for the wholesale route instead. This means you’d be free to resell these things, though you’d have to buy at least 25 to 499 to get them at the $14.40/piece price. Hey, I saw a replica of this in a thrift shop in Hongkong last month. And it's cheap!